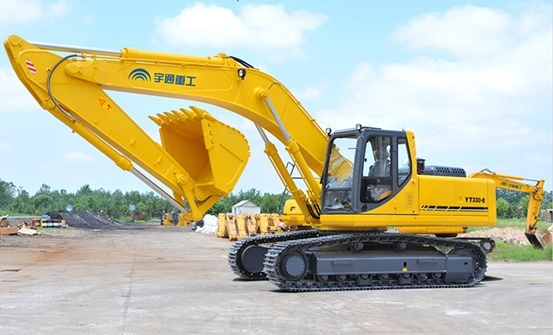 We are the worldwide supplier of Excavator: YT 300.8 Large Excavators. Please contact us for your Excavator: YT 300.8 Large Excavators. The models can effectively increase efficiency by 8% and decrease energy consumption by 20% in addition to surpassing the capacity of previous generation. It has achieved the best balance between high capacity and low fuel consumption and the the optimal cost performance; high power and fast move bring excellent cost efficiency and the reliability and durability verified by the market. For the excavators which work in the environment where danger is everywhere, safety is the primary concern in the design. The design should be the global one that can meet international safety standards. The spacious and comfortable cab is convenient and comfortable for driver to operate and to concentrate, which is beneficiary to safety and high efficiency. More durable working device and frame and more reliable hydraulic system. The main machine is designed to accommodate a variety of different applied conditions, and is easy to install different accessories, which can achieve maximum productivity. The new excavator has a warning function to examine the work status and fault detection self-test report, so as to reduce the downtime to a minimum. Yutong has always been in a harmonious relationship with the surrounding society; its insistence on the philosophy of protecting natural resources and the Earth is the reflection of its social responsibility.